This post was stimulated by two recent events. First, a conversation I had at a curry evening organised by the amateur band that my wife plays in. My neighbour was a well-educated modern languages teacher in her early forties. We discussed our various jobs and she evinced surprise that anyone would want to work with insects and even when I explained the myriad benefits of understanding insect biology and ecology to her in terms of food security, vector control, detritivores, integrated pest management, pollination etc., she was still unconcerned about the lack of training provision for entomology and the dwindling number of young entomologists in the population. I also highlighted the growing disconnect between people and nature. Her response was that it was just the way it was and that people had other interests now! 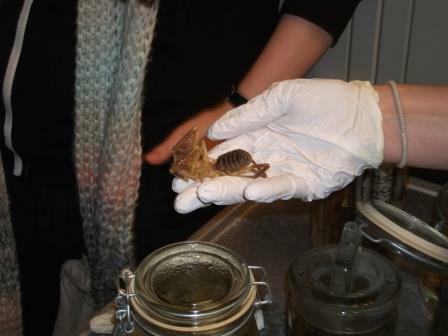 I was, despite the fact that I have bemoaned the lack of funding for invertebrate research and training for some time now, totally amazed and down-hearted. The second event was when one of my entomological colleagues reported to me how shocked he had been, when describing the recent opening of our new entomology building at Harper Adams University to his next door neighbour, a retired engineer, that the neighbour expressed great surprise that anyone would want such a facility and why anyone would want to spend that amount of money to enable entomological research. I have written before about my worries about the decline of interest in natural history and entomology (Leather & Quicke, 2009, 2010) but I feel that it is now well past time to do something urgently about this lack of understanding among the public, the educational establishment, funding councils and the government. Not only is institutional invertebratism (Leather, 2009, 2013) still alive and well but we now have two potentially life-threatening conditions that desperately need curing. 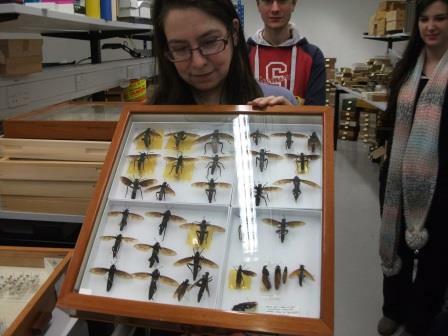 A concerted effort by all entomologists to explain to the general public, the educational establishment, funding bodies, the media and government why we need urgently more entomologists and why the study of entomology is crucially important to our well-being. I would go further than that and suggest that we need to redouble our outreach activities and to actively lobby those who hold the purse strings and those that represent us in government. 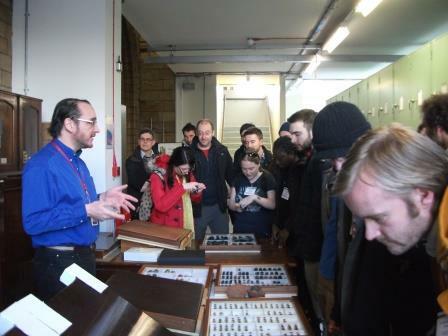 Yes, national entomological societies such as the Royal Entomological Society in the UK are doing much more to promote entomology than they used to but much more remains to be done. 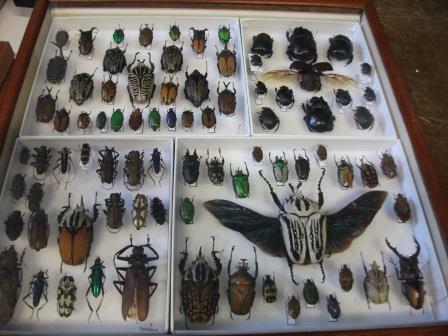 The Amateur Entomologist’s Society has, I have been reminded, also been active in this area for more than eighty years. My message to all entomologists is act now before it is too late. At the current level of investment into treatment and cures, very gloomy. I would be remiss if I did not point out that mycology, plant pathology and plant nematology are also extremely vulnerable and just as important to our well-being as entomology. Entomyopia is apparently not a new disease, shortly after posting this I came across this gem from 1882. Leather, S. R. (2009). Institutional vertebratism threatens UK food security. Trends in Ecology & Evolution 24: 413-414. Leather, S. R. (2013). 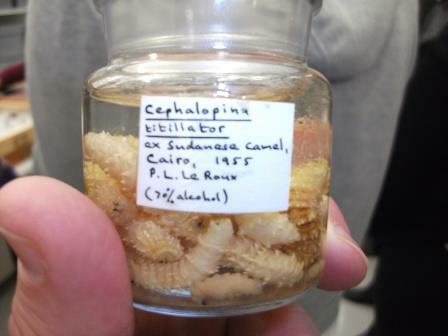 Institutional vertebratism hampers insect conservation generally; not just saproxylic beetle conservation. Animal Conservation 16: 379-380. Leather, S. R. & Quicke, D. L. J. (2009). 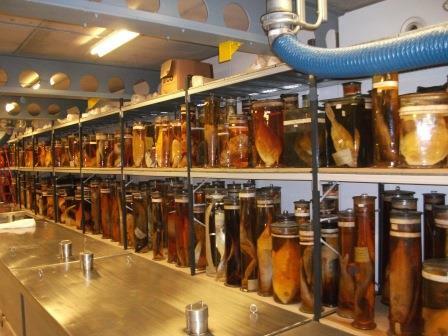 Where would Darwin have been without taxonomy? Journal of Biological Education 43: 51-52. Leather, S. R. & Quicke, D. L. J. (2010). Do shifting baselines in natural history knowledge threaten the environment? Environmentalist 30: 1-2. Artistic licence – it was still dark when we left! The name of the coach company is particularly apt. Just over four hours later we arrived outside the front of the Natural History Museum on Cromwell Road. 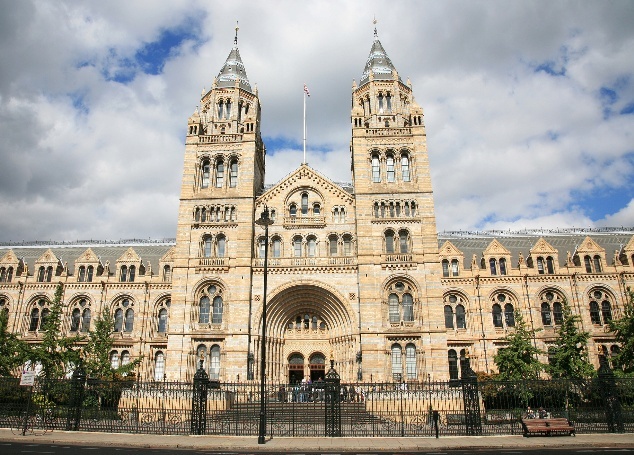 The front of the Natural History Museum London; when I was a child the beauty of the facade was obscured by soot and grime. 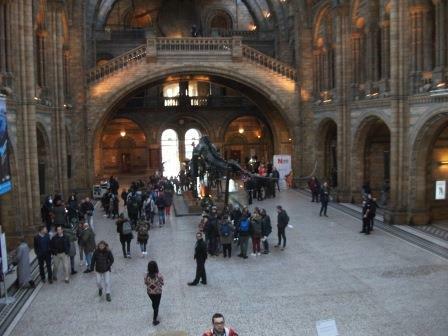 Dippy the Diploducus, shortly to be replaced by the Blue Whale skeleton. 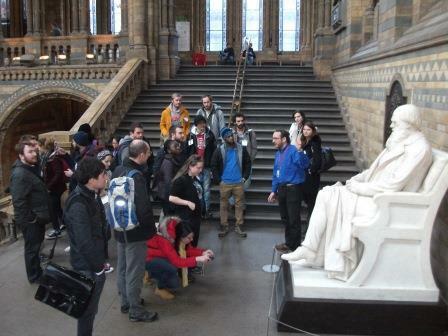 The blue whale skeleton in my opinion has two advantages over Dippy, first it is real, not a model and second it is actually my first ever biological memory, aged 3.
we entered the first of our scheduled stops, the Coleoptera section. 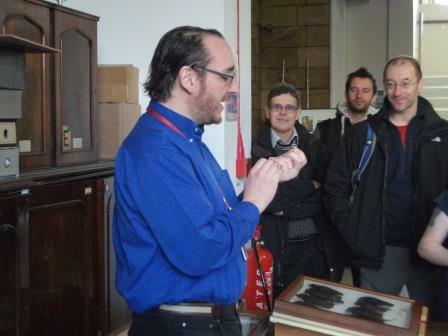 Here Max enthralled the students with the magic of beetles large and small. 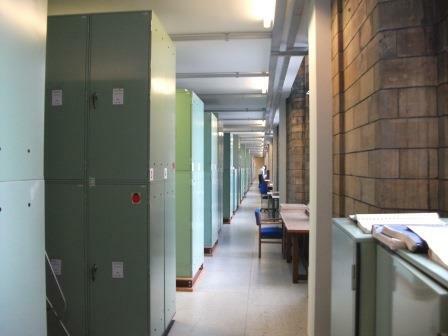 A very small selection of Wallace’s collection. 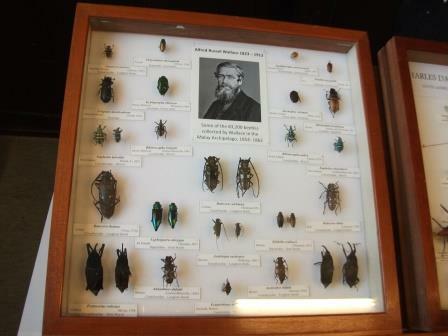 some of the beetles collected by botanist Joseph Banks (as Max pointed out he appeared to be only able to collect large and showy specimens, whereas Darwin’s were much smaller and harder to identify. We were also privileged to see a beetle collected by palaeaoanthropologist Louis Leakey whilst excavating hominid remains in the Olduvai Gorge. Max relating the story of how Louis Leakey thought he had found a fossil beetle. 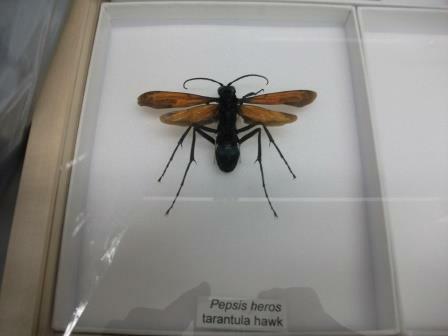 We then moved on to the Hymenoptera; unfortunately Gavin Broad was not available so we did not have the benefit of a specialist to enthrall us although we did see some interesting specimens such as this Tarantula Hawk Wasp. We then broke for lunch before meeting up with, in my opinion, the most entertaining Dipterist in the World, Erica McAlister, also known as @flygirlNHM. Erica with some rather large flies. She showed us bot fly larvae from unexpected hosts, camels, elephants and rhinoceroses whilst regaling us with amusing and risqué anecdotes of fly mating behaviour. 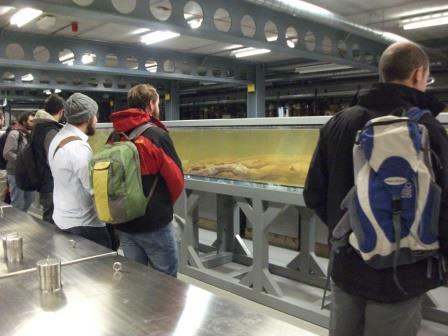 Then Erica led us into the depths of the museum to the Tank Room to look at some larger animals, or as Erica described them “The Big Pickles”. Some of the pickles were very big indeed. 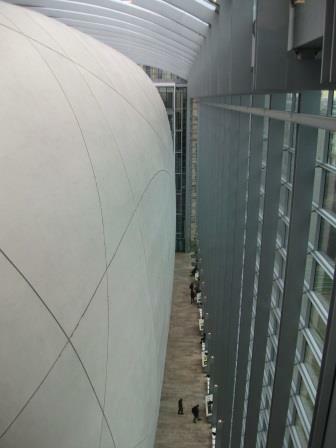 Sideways view of the cocoon. entered the world of the little pickles – spiders and their allies, some poisonous, some venomous. There is a difference, check it out. A Camel spider; a Solifiguid, despite the common name, they are only very distantly related to spiders. 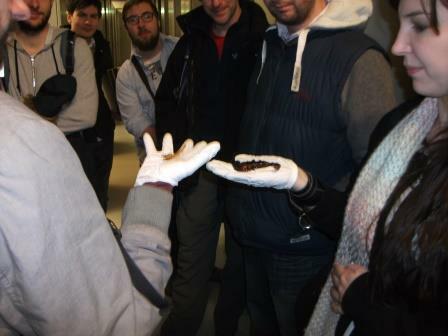 MSc Students and scorpions; big and relatively harmless, small and deadly (not the students). The gloves protect against the preservative, not the possibility of being bitten! And then sadly, it was time to get back on the coach and make our way back to Shropshire and Harper Adams University. 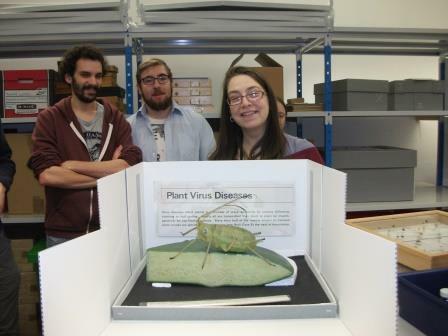 A great day out, made particularly enjoyable by the obvious passion that Erica and Max have for their insects. If you ever get the chance to see Max and Erica extolling the virtues of their pet beasties, make sure you do so. Effervescent, ebullient, enthusiastic and energetic entomologists both. I am sure that I speak for all of us who made the trip when I say “Thank you Max” and “Thank you Erica”. It was only when I was writing this blog post that I realised that this visit was exactly a year after our previous visit. 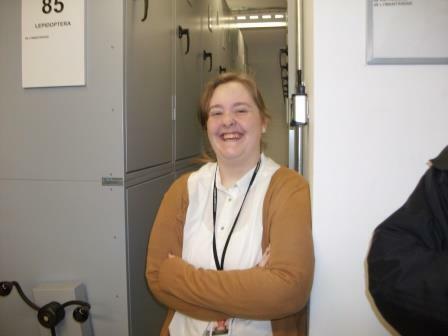 The other huge benefit of these visits is that it very important to let the students see that you can work as an entomologist in a museum without being male and grey-bearded 😉 In which context it was very nice to bump into one of our ex-students, in fact one from the very first cohort of the MSc in Entomology after our move from Imperial College to Harper Adams (a story for a future post).